Gift cards and Certificates give your customer a convenient choice when deciding on a gift. They also guarantee that the receiver of the card will be purchasing from your establishment. Custom printed plastic gift cards are playing a big role in today’s marketplace. We offer a full color, 30 mil plastic card, printed double sided and encoded for POS systems with a magnetic strip on the back. 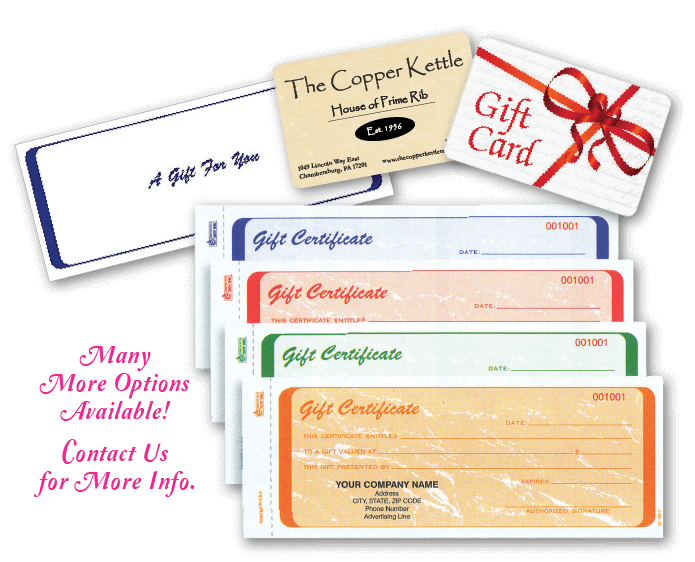 Gift Certificates come in a wide variety of options from stock templates, to full color custom designs. Numbered, perforated, and duplicate options are also available.